Infants eczema is a resource for quality, factual information about baby and infant eczema, how to deal with eczema and what products to use to avoid irritating the infants skin. Eczema is a term used to describe a wide range of different skin problems that trouble people throughout their lives, from babys, infants to fully grown adults. Eczema is a variety of skin problems that occur throughout infancy. There are a few various kinds of eczema, the most widespread being "Atopic" which is mainly suffered by babies and children. Eczema symptoms can affect infants in various ways, from the slight redness of the skin to relentless itching. Eczema tends to be dry thus reducing the protective nature of the infants skin causing it to be less effective at protecting from fluid loss, heat, cold and bacterial infection. That�s why it�s essential you make a good effort to continually moisturize your infant�s skin. 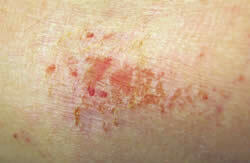 The redness of the eczema can fluctuate during the year it is made worse by scratching. Most forms of eczema itch differing from mild itching to a constant distressing itching. With severe eczema (pictured above), caused by lengthy eczema scratching, the skin's protective character is reduced and it becomes wet. Wet eczema is more likely to become infected therefore it�s important to treat it.